All of the above can be used in various helpful ways. The sole purpose of a gun is injuring and killing another living being. It was created as a weapon. It was made in order to kill. Seriously. That's a really dumb argument. Oh "the sole purpose." So I guess when someone is target shooting they aren't using the gun correctly since they aren't killing other living beings. It says "inanimate objects don't cause crime." It's a fact. It is not an opinion up for debate, and it's not an argument. If I hold a gun in my hand will it force me to shoot people? Knives were invented to kill and skin animals, and refined to kill humans. You didn't really make a point, but you have no point Roy. Millions have died from swords(large knives). Fire was used for warmth and for cooking "living beings." This old argument is ridiculous. These objects are instruments of crimes as much as the people who hold them. Guns can never be used in a defensive capacity? Well as long as we're starting along with this faulty logic, let's keep it going. I believe this is an example of a slippery slope fallacy. 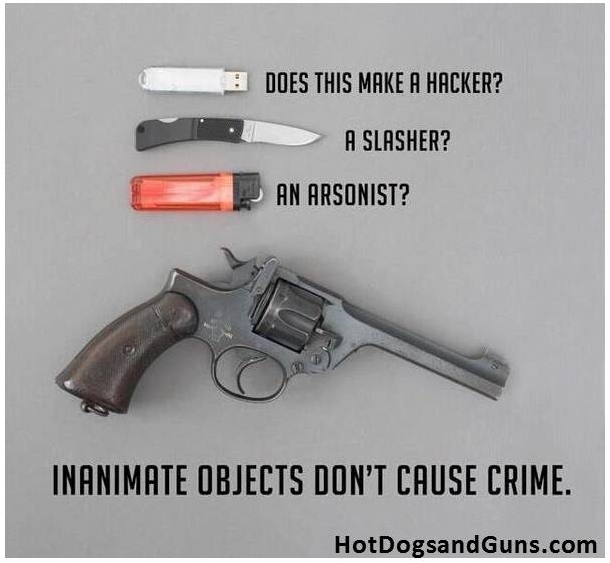 Inanimate objects do not cause crime. A lighter does not make you an arsonist. A gun does not make you a serial killer. Having a suitcase nuclear weapon does not mean you will use it to blow up a city and kill millions of people. Therefore, all citizens should have access to personal nuclear weapons, or else no one anywhere can carry a spork. Inanimate objects do not cause crime, but they facilitate crime. If you would like to go into a train station and blow everyone away, it's easier to do that if you can buy an AK from a store in your town. If you think assault weapons and the like should be legal because the benefits outweigh the negatives, that's one thing, but don't pretend that the availability of guns has no bearing on crime rates. Actually you are correct, the availability of guns does have an effect on crime rates. Where you are wrong, however, is that you assume more guns means more crime. It has been proven across many states, and countries even, that the less strict gun control is, the fewer gun related crimes are. One example is compare New York state (highest gun control in USA) and Texas (similar yet larger population size, less gun control) the crime rate in Texas is much lower than in New York, even with a higher population. It is suggested that the reason is the fact that more people can, and do, legally own guns. Let me ask you. 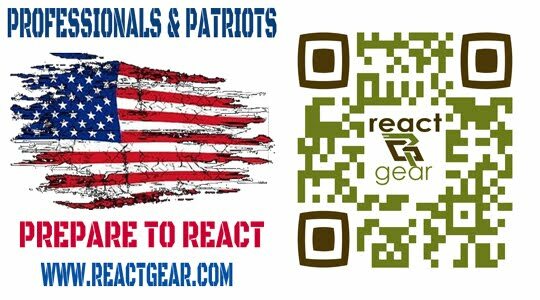 if you knew that nearly everyone in your town owned a gun legally, and carried it with them on a regular basis, would you with either a legally or illegally obtained firearm, use it to commit armed robbery? Posed a different way, if you knew that the chances of you meeting someone with a legally obtained firearm were almost zero, and you had an illegally obtained firearm (as gun control laws never really curb illegal traffic) you now know you have an upper hand using it to commit your crime. And since most crimes worth committing require a gun, there are higher rates of general crime. If you will do something illegal like shoot innocent school children, is a law saying you can't buy a gun really going to stop you? Does the fact that having commercial grade explosives illegal for all but businesses with permits stop people from making commercial grade bombs in their backyard? Kids and criminals create bombs frequently even though it's illegal. and you can make an improvised shotgun and load your own bullets for fairly cheap. If all guns became illegal, the illegal gun traders would just start making their own at a premium. You can't stop people from killing people, so why not make them think twice before they try it. Arm the average citizen, or at least make it easy for him to arm himself. And make gun safety (at a minimum) a requirement in schools. No one is suggesting that all guns should be illegal, in the same way that no one (should) be suggesting that every citizen should have to be prepared to defend themselves with lethal force on a daily basis. I don't think it's unreasonable to say that a home-made shotgun pretty much pales in comparison to a manufactured AK or M16 in terms of the personal destructive damage one becomes capable of. A lighter doesn't make you an arsonist. That doesn't mean everyone should have access to a military-grade flamethrower. So why should everyone have access to military-grade firearms? Gun control can't solve the problem completely, but it's part of a balanced approach to reducing gun violence.